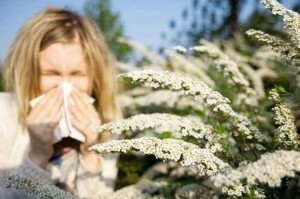 Hay fever is another term for nasal allergies, which affects millions of Americans. Although many suffer with seasonal symptoms during Fall (Ragweed Season) and Spring (Tree pollen Season), many others suffer year round from allergies to indoor irritants such as dust, dust mites, mold and mildew, and pet dander. Some are also allergic to certain foods and chemicals. At Woodstock Ear, Nose and Throat, Dr. Pratt can determine the cause of your discomfort and develop a management plan that will improve your quality of life. Although allergies are rarely life threatening, they often cause a negative effect on work or school performance, concentration, attention span and hearing. Some children may even become pre-occupied or disruptive and may be misdiagnosed with ADHD (attention deficit, hyperactivity disorder). Options for treatment include avoidance (removal of offending irritants such as dust and pets), salt water nasal washes (with NetiPot or Sinus Rinse Kit), and medications (both nasal and oral). Some respond well to over the counter (OTC) medicines such as antihistamines, however some OTC Antihistamines (especially Benadryl) may cause harmful drowsiness. Some use OTC nasal decongestants such as Afrin Nasal Spray, which can become addictive and can eventually cause worsening of nasal allergy symptoms. When should you consult a doctor for treatment? An Otolaryngologist (Ear, Nose and Throat Specialist), such as Dr. Pratt, is the expert in the evaluation and treatment of hay fever and all forms of nasal and sinus abnormalities. By taking a complete history and performing a comprehensive physical examination of the head and neck, Dr. Pratt is able to diagnose the nature and extent of your problem and recommend appropriate management of symptoms which remain uncontrolled with over the counter treatments. He will assess the nose and sinuses and determine if infection or structural abnormality (deviated septum, polyps) is contributory. In addition he will determine the need for allergy testing, allergy shots or surgery. What can you do to reduce exposure to the most common allergens?